When I was a child at the innocent age of six, my favorite grandmother passed away. I didn’t know how to process death. All I knew was I wanted my beloved grandmother back, and I wanted to feel her spirit. I didn’t know how, I just wanted to connect with her again. I subconsciously found a way to do that. Soon after her death, I stumbled upon her booklet of poetry. I didn’t know my grandmother was a writer. I read her material, and I felt like I was reading a famous poet’s work. I was flabbergasted. It was like this mysterious secret about my grandmother unfolded right before my eyes. I wanted to be just like her — just like that! So, I bought a black-and-white notepad and pencil and started creative writing my own short stories and poetry. Let me also mention, I was obsessed with rainbows, drawing and coloring them as a kid too. I had no idea why then, but later on in life, it came back around full circle…all of it. Fast forward to my early twenties. After two years at Florida State University with an undecided major, a boyfriend who was in a serious car crash and badly injured, I decided to move back home to Cooper City, FL and attend Florida International University in North Miami. Part of the reason I moved back home was to be closer to him. By the way, he is now my husband, and it’s because of that car accident we’re still together, twenty-years later. Another story of manifestation for another time. I didn’t know what I wanted to major in until my father suggested I would be good in Journalism/Broadcasting. I never thought of it. I was lost and confused at the time about my passion, and he thought it would be good for me because he knew I enjoyed writing and didn’t mind being in front of a camera. I went for it; I’m so glad I did. It turned out to be one of the best decisions of my life, because it taught me how to be a better writer, the craft of telling a good story, learning how to listen and interview to make for a better storyteller, and also it helped perfect my grammar. After graduation, I had my heart set on becoming a journalist/broadcaster and interviewer. However, fate had other plans. Months and months lead into years, and I couldn’t find my dream job. I resorted back to bartending for awhile after college to pay my bills, and I even took up traffic producing at one point. I hated it and was miserable. My living arrangements and relationship hit a low and big turning point, and I was forced to make personal decisions that affected my professional ones. I eventually decided not to move out of state, to stay behind and support my fiancé who was then in nursing school. I didn’t want to leave him. Our relationship was on the rocks, and in order for it to work, I had to actually put in the work. I chose us. So, my broadcast/journalism dreams were put on the back-burner. Boy oh boy, I’m so glad they were. All of this happening behind the scenes, I later learned, was all part of a much bigger plan. I was not meant to find a dream job in journalism. Thank heavens for that, because as I see journalism today, I do not have the backbone or am not meant for it. Through that time during rebuilding our relationship and planning a wedding, I wanted to get back to my love of telling stories and creative writing. I also began working with my mom and her charity, which benefits the special-needs’ population, including autism. She needed help at the time with opening up a residential facility, fundraising, and public relations, and media press releases on it. Fortunately for her, my work with journalism school and internship at WSVN 7 News in Miami with Entertainment TV (Deco Drive), I had exactly what she was looking for. Coincidence? I think not. The stars were aligning. Manifestations and dreams were taking place behind the scenes. During this time, I came up with the idea of a humorous, animal-talking, chapter book called, MURPHY: THE PHAT CAT. It was based on the inspiration and my real-life pet and black cat, Murphy, who reached thirty-five pounds at one point. I’ve always had a lot of pets; my family and I are animal lovers! I wondered how my pets would sound if they could talk. What their personalities would be like if they came to life on paper? That is how MURPHY: THE PHAT CAT manifested. It’s about a cool, 35lb. 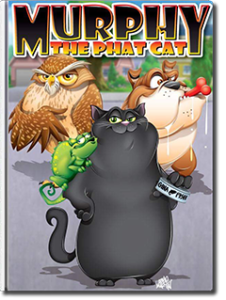 (phat, not fat) cat named Murphy who must try and save his fellow, furry friends in their peaceful suburban neighborhood from a gang of bullying burrowing owls who have recently moved in causing chaos…paid in return with tuna fish. I wanted to originally write this as a screenplay. I bought a book on how to write one and quickly became discouraged when I read one’s chances in Hollywood of ever getting picked up, and it being made into a movie. Self-doubt crept in and won. So, I decided I’d have a better shot of it ever reaching an audience if I wrote it as a children’s book — another great decision that set me up for my manifestations to unfold, even though I didn’t know it yet. I had no idea what adventure I was about to embark on, and how it would mold and teach me to become a published, children’s book author, and eventually, screenwriter. Not overnight, though. It took years and years. After writing MURPHY: THE PHAT CAT as a book, I joined SCBWI (Society of Children’s Book Writers & Illustrators), went to conferences, joined writers’ critique groups, met other children’s book writers, did many revisions on the manuscript, and realized this is what I wanted to do with my life. It wasn’t just a hobby anymore. It was my life’s dream, passion, and career path. I perfected it best I could. I submitted the book to hundreds of agents and publishers (combined) to no avail — rejection after rejection. Years of discouragement. During those years, my best friend of seventeen-years died in a tragic accident at only the ripe young age of twenty-eight. I was in a dark place, and I needed to use writing as my therapy. This story came to life inside of me, and I had to tell it. RAINBOW CRYSTAL was my second children’s book, yet first to be published. MURPHY: THE PHAT CAT was meant to be put on hold for a little while. RAINBOW CRYSTAL was manifested through my pain. It is a middle-grade, fantasy novel about a ten-year-old girl who loses her best friend in a tragic accident, and shortly learns thereafter that she is the chosen one to journey through a magical world inside a rainbow to return a powerful crystal back to its wizard owner, which was stolen by an evil witch and her trolls. It’s a book about true friendship, grief, and finding hope again after loss. It’s also a magical, adventurous book filled with mystical and mythical creatures. There’s that rainbow I was talking about earlier. I colored them as a kid, now I was venturing through one in a book. Not to mention, that our charity was also named RAINBOW GUARDIAN. WIZARD OF OZ was always a family favorite around our house. It all came back around, like I said earlier. Another finished book. Years of writing, and more years of rejection. But, I never stopped submitting and believing in my dreams. I did the journaling. I wrote my dreams and manifestations down, including on the Postcards to the Universe postcards. I also created vision boards and did life coaching work. I got knocked down over and over, but I continued to get back up. I wouldn’t let it stop me. I kept saying it would happen, even in my darkest days when I doubted myself and was in a self-pitying party of despair. I never gave up. I just kept going. Failure was not an option. Then, one day, it just happened. I got that letter from my publisher. “We love your book. We want to publish it. Welcome to the family!” It was one of my deepest and greatest dreams come true! It didn’t happen overnight, and it definitely didn’t happen in the way that I thought it would, but it happened in the way and in time that it was meant to. It all unfolded divinely perfect. I manifested it because I didn’t stop working for, believing, and visualizing it. I also believe in more and even BIGGER dreams and blessings to come in. I’m just getting started. 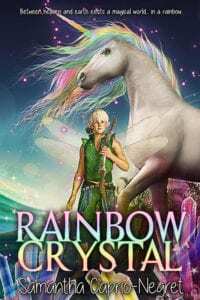 RAINBOW CRYSTAL was released on May 15, 2018. The book cover art design came out more beautiful than I ever envisioned, and my book-launch event was a dream come true! That was everything I ever envisioned and more. Then, it happened again. Four months after RAINBOW CRYSTAL was released, I got a second letter from another publisher. They wanted to publish MURPHY: THE PHAT CAT. It said it again, “Welcome to the family!” No better feeling than that. My first literary baby. Bittersweet. Finally…out there into the world. And guess when I got the news? On my birthday. Yup! It was my personal gift of manifestation from the universe. It was saying, “This is your purpose. This is why you’re here. This is your present.” It will be released August 2019. Let me also mention that I received the publishing contract for RAINBOW CRYSTAL on the one-year anniversary of Murphy’s death, and I signed the contract on my sister, Melisa’s, birthday. More coincidences? I think not again. All of my dreams coming to fruition, and on the special dates that were meaningful to me, were only signs from the universe that it was all meant to be and unfolding exactly the way that it was meant to. Let me mention that during all the years of writing these two books, I took breaks to have a family. I currently have two children, Bella (8) and Lorenzo (4). But, I also simultaneously wrote my screenplay, MANO NERA (BLACK HAND). After a fate encounter with a movie producer, another opportunity presented itself. It’s a true story about my Italian great-grandparents who beat all the odds against them. 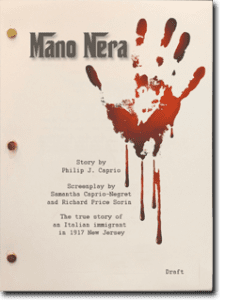 MANO NERA is a murder-revenge-love-story and time period piece. It’s still looking for the right home in Hollywood, but after all that has happened with my children’s books, I believe it will. It will fall exactly in the right hands at the right time. My point here? You remember the book I told you I bought on how to learn to write MURPHY: THE PHAT CAT as a script? I never used it for that. But, when it came time, I needed it for MANO NERA. When I bought the book, I never realized that one day it would be for a much better purpose. I manifested the screenplay the day I bought the book on how to write one. You see…God would not plant the seed of desire in your soul if you weren’t meant to do it. The dream, passion, wish is in you for a reason. Go after it! Believe in it. Never ever give up on it, and you will manifest it! I know, because I did.